The rhythm section is the heart and soul of the jazz band, but many jazz ensemble directors are not rhythm section players. A good rhythm section makes all the difference in how good the band sounds. Every chart in First Place for Jazz includes a set of four Rhythm Sectionals. The Rhythm Sectionals help the rhythm section work on different sounds and techniques that are unique to the rhythm section. 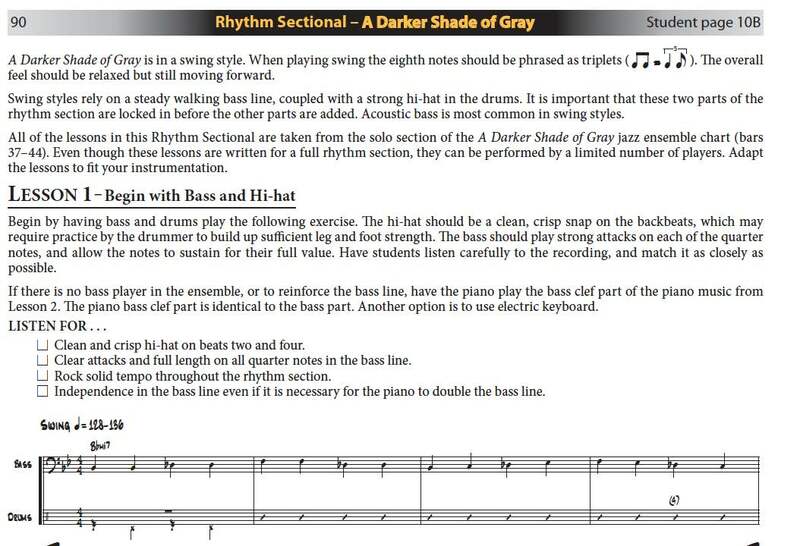 During each of the four lessons rhythm section concepts are broken down into smaller elements, allowing for a greater overall understanding of what is happening in the rhythm section. This greater overall understanding benefits both the students and the director. Each of the four rhythm sectional lessons is recorded for demonstration. At the end of the four lessons, each individual instrument gets their own Rhythm Section Practice Track, that allows that individual instrument to apply the concept in that rhythm sectional with their part omitted from the mix. All rhythm sectionals, of course, apply to the tunes also. Here is a complete listing of ALL topics and techniques covered in the Rhythm Sectionals. See below for audio and print examples from the student and director books. 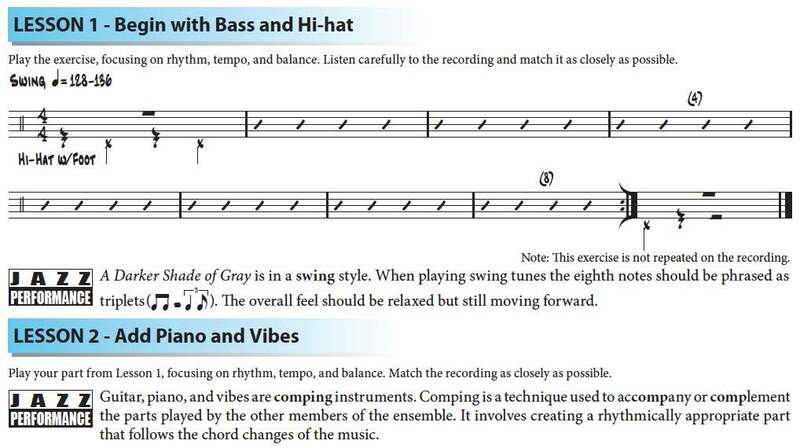 In the student books, all rhythm sectional lessons appear on a single page that includes music and helpful text. In the Director Score, each lesson includes a full rhythm section score as well as loads of guidance in terms of what to work on and what to listen for. The non-rhythm playing director now has plenty of information at his or her fingertips to help this most crucial section of the jazz ensemble.